From Charles Dickens classic novel Bleak House. This was the first ever mention of a Dinosaur in any work of fiction. The name Dinosaur itself had only been coined ten years earlier by Richard Owen. Despite this the beasts were fast catching the public’s imagination and this reference, like much in Dickens novels reflected what was going on at the time. The very earliest Dinosaur novels that followed after such as like The Lost World, Journey to the Centre of the Earth and The Land That Time Forgot would lay down the foundations for nearly every Dinosaur story that came after across all mediums. From King Kong, to the Land of the Lost, to Turok Dinosaur Hunter. Since the heyday of Sir Arthur Conan Doyle and Edgar Rice Burroughs there have been many more exciting and ground breaking Dinosaur novels, such as Jurassic Park which helped to bring new and exciting theories about Dinosaurs to the public’s attention and changed how we viewed them. I think that many of the greatest Dinosaur novels can help to show that Dinosaur fiction isn’t just something for children. So many people tend to view having an interest in Dinosaurs as being childish, like in the American sitcom Friends for instance where the character of Ross Geller is ridiculed by both the writers and the other characters for his love of Dinosaurs. However stories like Journey to the Centre of the Earth, Jurassic Park and The Lost World were written by the likes of Jules Verne, Michael Crichton and Sir Arthur Conan Doyle, among the most accomplished writers of all time. Clearly these great literary minds didn’t just see the subject of Dinosaurs and prehistoric life as a childish. Their stories about Dinosaurs have also evidently stood the test of time as I will hopefully show you in this article as I run through my favourite Dinosaur novels. These will not be presented in any order of preference, as ultimately I found that I couldn’t rank them so instead we will just be looking at my favourites overall. The first novel to focus on prehistoric creatures. I wasn’t sure about whether or not to include this as technically there are no true Dinosaurs in it. The marine reptiles who attack our heroes are not actually Dinosaurs remember. Still I feel I have to include it in this list for a number of reasons. To start with whilst creatures like Plesiosaurs may not technically be Dinosaurs they are still often viewed as such in popular culture. Furthermore this was the first book to actually feature prehistoric creatures at all. Particularly those who lived at the same time as the Dinosaurs. Also most importantly Journey to the Centre of the Earth is essentially the template for close to every single Dinosaur story for the next 150 years. It is the first story to revolve around a remote area on earth where prehistoric reptiles still roam. Whilst there are a few pieces of Dinosaur fiction that don’t follow this formula. Primeval, Jurassic Park, One Million Years BC etc. The majority do follow the basic premise of there being some little remote area on earth, a valley, a plateau, an island, an underground cave, where Dinosaurs, prehistoric mammals, Pterosaurs, Plesiosaurs, maybe even a tribe of proto humans and ape men or giant apes, still exist into modern day. Sir Arthur Conan Doyle’s The Lost World and Edgar Rice Burroughs The Land That Time Forgot both follow this idea; except they moved the land of Dinosaurs to above the ground. Later films such as Gwangi and King Kong also stick to Verne’s formula beat for beat too. Even Godzilla the original film starts with this same premise as Godzilla is shown to have come from a remote island where Dinosaurs still roam before he was mutated by an atomic blast. There are even many other stories that revolve around the idea of Dinosaurs living in a land that exists within the Earth’s core such as Edgar Rice Burroughs Pellucidar series which began with At the Earth’s Core as well as the Russian novel Plutonia. Most Dinosaur stories are really just variations of Verne’s idea, though that’s not to do down these other works, as the variations ultimately allow them to stand out as classics in their own right. It should be acknowledged at the same time that Journey to the Centre of the Earth was not the first Hollow Earth story either. Nothing is completely original as just about every story has been done, so all you can really do most of the time is just add a new variation to an old idea. Still ultimately at the end of the day this is the forebear of most Dinosaur fiction so in spite of the fact that there are no true Dinosaurs in it. (Only marine Reptiles and prehistoric mammals.) I still have to include it here. The novel itself aside from its literary significance still holds up as a great adventure. Some critics have responded negatively to the fact that compared to Verne’s other novels, the science in it is rather dated. It has also been criticised for its very slow pace. . Still personally I found it an enjoyable read right the way through. The scientific goofs don’t bother me as at the end of the day it is science fiction. Plus whilst I know a bit about Dinosaurs, the same as any nerdy guy, I’m a complete scientific illiterate anyway. Also I found the build up to their adventure at the centre of the earth interesting as the three main characters, Otto Lidenbrock, his nephew Axel and their guide Hans are all very engaging. Lidenbrock is a total hot head and the classic insufferable genius type of character like Sherlock Holmes (who he predates by about 20 years) taken to the utmost extreme. He actually locks his own nephew and maid in the house and starves them until he can find a way to crack an ancient code! Despite this he is given a few moments that show deep down he does care for his nephew in spite of his borderline psychotic behaviour towards him. Axel meanwhile is a complete coward and utterly useless. In fact his bumbling almost kills them and briefly strands them in the valley at one point. Hans meanwhile functions more as the straight man of the group and helps to balance out the two more extreme personalities of his companions. The lost world of the story is intriguing as we don’t really know much about it. In later lost world stories we often get a complete image of the valley/island/plateau the main characters travel too. In King Kong and The Lost World we see the natives customs and even little bits of their history too. Peter Jackson did a whole fictional documentary about the history of Skull Island. Here however it feels like we are only given little glimpses. On the one hand unlike Burroughs later Pellucidar series, Verne isn’t given a chance to really create his own unique little world in quite the same way, but on the other it does allow Verne to build up a more effective atmosphere. When the main characters discover the remains of a large ape man they decided to avoid encountering one at all costs, which actually helps to make the creature more sinister. For all we know it may have been a peaceful, gentle even somewhat advanced creature that felt a kinship with the human explorers. Or it may have been a savage monster that would have ripped them limb from limb. We don’t know and this is actually more frightening, as the reader is allowed to build up an image of what the true beast could be like and it becomes much more tense the knowledge that this large, mysterious creature could be lurking around any corner. For all we know it could be stalking them. Maybe its intelligent enough? Sadly Journey to the Centre of the Earth is not quite as remembered as some of Verne’s other works, but its impact of the genre is immeasurable and it has spawned a few adaptations over the years including 2 live action films, one in 1959 starring James Mason and another in 2008 starring Brendan Fraser. Neither are particularly faithful to the novel, though both are still good movies nonetheless. The 2008 film does actually have genuine Dinosaurs in it too. Overall a classic of the genre and the template for most Dinosaur stories. 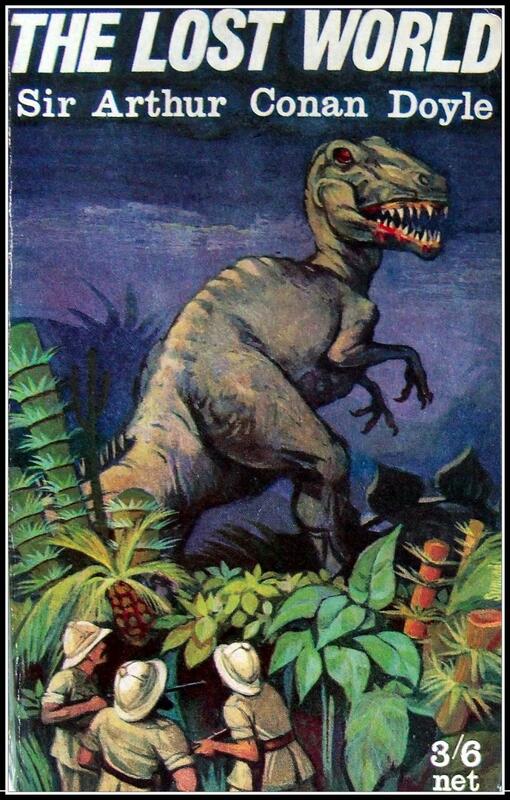 From the creator of Sherlock Holmes, this was the first true Dinosaur novel. This novel see’s Professor George Challenger lead a team consisting of himself, Lord Summerlee, Lord John Roxton and Edward Malone to a plateau high above the Amazon rainforest where a variety of prehistoric creatures as well as a tribe of human beings and vicious Ape men who are at war with each other roam. Challenger and his team help the natives wipe out the Ape men and later escape the Plateau with a Pterodactly egg which later hatches in London, giving Challenger the proof he needs of his exploits. Whilst Journey to the Centre of the Earth may have created the Lost World trope, this adventure perfected it. 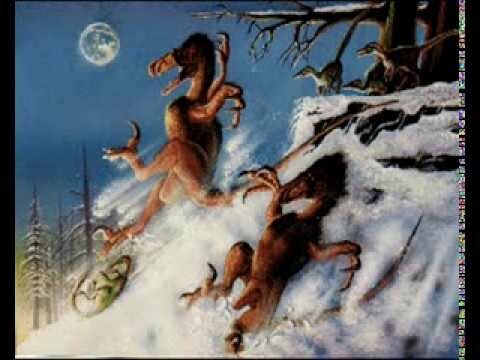 Far more aspects of this story pop up in future Dinosaur stories than from Verne’s novel. The tribe of humans, the giant two legged meat eating Dinosaur that stalks our heroes throughout the novel, and a creature from the lost world of Dinosaurs being brought back to a big modern city like London or New York. All of these are staples that we see recur throughout Dinosaur stories like King Kong, Gwangi and the Jurassic Park films. Doyle’s Lost World is much more fleshed out than Verne’s. There are advantages and disadvantages to this. On the one hand there is less of an atmosphere and mystery about Doyle’s plateau, but on the other hand we do get more exciting Dinosaur sequences as a result such as the Allosaurus’s attack on the natives village. 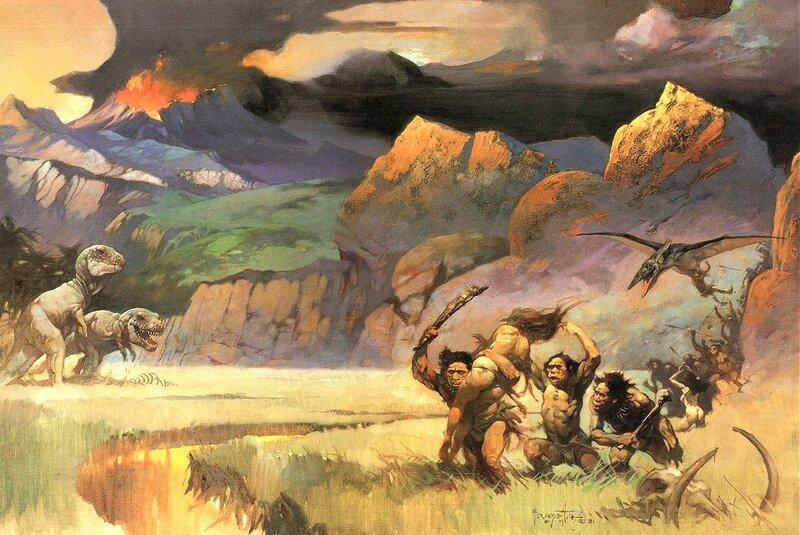 The fact that we see the plateau in great detail also allows Doyle to explore interesting ideas like how human beings would live alongside prehistoric beasts and how they would manage to tame them in some cases, yet be completely humbled even with all of their ingenuity by the large meat eaters. The natives are given a very sympathetic and 3 dimensional portrayal unlike in some later adaptations of the novel such as the Irwin Allen version in 1960 or other films with a similar premise such as King Kong. Whilst much of Conan Doyle’s work was of its time it is true that he was a very progressive writer in a number of ways too. He created one of the most memorable female characters in all of fiction in the shape of Irene Adler who manages to be the only person to beat Sherlock Holmes whilst another short Sherlock Holmes story by him “The Adventure of Charles Augustus Milverton” features another female character who wins Holmes respect and actually kills the main villain of the story instead of Holmes. Thus the Lost World similarly can be seen to perhaps be ahead of its time in that the main characters are shown to have the utmost respect for the natives and their customs and the natives are also depicted as highly civilized and advanced. In all fairness to Doyle however there weren’t that many Dinosaur species known when he wrote this book. Even Tyrannosaurus Rex though it had been discovered by this point, it’s fossils were not that well known. I suppose in this respect Doyle did not bad in using his single meat eater, in a variety of different ways. First the Allosaurus creeps about in the darkness after murdering the Iguanodons before it attacks the camp. Here we just get a fleeting glimpse of how immense and dangerous it is as the explorers are tormented by the sounds of the Iguanodons screaming in the dark before it pounces on them. Then later Doyle manages to make the beast seem even more frightening when Malone having gone exploring on his own, is suddenly cornered by the beast. Its one of the most harrowing scenes from the novel as Malone, unarmed and in the dark is being pursued by the giant monster that single handedly slaughtered an entire Iguanodon herd. Another problem with The Lost World is that Edward Malone, the main protagonist is a bit bland. Lord John Roxton meanwhile is also at times a bit annoying the way he is shown to be perfect at everything. Challenger and Summerlee make an interesting team however. They are almost like two squabbling brothers trying to constantly get one over on the other. Its also nice seeing them eventually grow to respect each other and even develop something of a friendship over the course of their time on the Plateau. Though they never become close, they best they become is vitriolic friends. Professor Challenger was actually Conan Doyle’s favourite character that he created even more so than the great detective himself. Challenger is a brilliant creation. He is cut from the same cloth as Sherlock Holmes in the sense that he too is a maverick genius who plays by his own rules, yet he is almost the complete opposite in every other respect. He is loud, short tempered, violent, boisterous, even physically he is an absolute tank of a man with a massive beard. There is one funny sequence where the leader of the ape men feels a certain kinship with Challenger as he resembles him so much. Whilst Challenger may not have as complex a personality as Holmes he still has a huge presence which does somewhat make up for Malone’s blandness. The Lost World has been adapted more than any other Dinosaur novel across both film and television. Sir Arthur Conan Doyle himself even appeared in the first ever adaptation in 1925. None of them stay completely faithful to Doyle’s novel. A female explorer is always added for a bit of variety and also often to supply Malone with a love interest. This began with the very first adaptation in 1925. Roxton also tends to vary between being a hero, an anti hero and even in some cases an outright villain. Tyrannosaurus Rex also often takes Allosaurus’s place as the king of the Lost World too, whilst the natives are often presented in a much more unsympathetic light, though many versions have added a sympathetic native girl at least who helps to save the explorers and may even become a love interest of Malone or Roxton. The friendly female native first appeared in the 1960 Irwin Allen version and has been a staple ever since. To be fair this character does have something of a small precedent in the book itself. Just before they leave the Plateau all 4 of the explorers are offered up wives by the natives, but they politely turn them down. Their proposed wives play no real role in the story however, but the idea of the explorers finding romance as it were on the Plateau is not entirely a deviation from Doyle’s story. The most faithful adaptation of Doyle’s novel is arguably the 2001 tv miniseries produced by Tim Haines the man behind Walking with Dinosaurs. This version stays close for the most part to the original novel and even has Allosaurus as the main Dinosaur and refreshingly portrays the natives as a civilised and advanced society rather than a group of vicious savages. However once again there is a female explorer and whilst the natives are portrayed sympathetically, they do still turn on the explorers after Challengers actions accidentally cause the two Allosaurus to attack the village. The natives however seem to forgive Roxton who in a further deviation is left behind and marries the friendly native girl of this version. 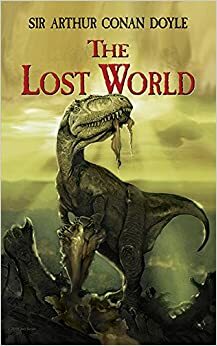 The Lost World is to Dinosaur fiction what Dracula is to Vampire fiction. Its the quintessential Dinosaur adventure and one of the most influential pieces of prose ever written. Sir Arthur Conan Doyle would be surprised to see the two women as well as the T-Rex’s on his plateau. Edgar Rice Burroughs classic boy’s own adventure is yet another variation on the Lost World theme, but its actually a somewhat darker, grittier adventure than either The Lost World or Journey to the Centre of the Earth. In both of those stories none of the main characters actually died. They also had happy endings with the main characters being proved right about their scientific theories and even getting married. In this story however the two main protagonists are left stranded on the lost island with seemingly no hope of rescue. Added to that whilst there is some conflict between some of the main characters like Challenger and Summerlee. Ultimately all of the main characters in both Journey to the Centre of the Earth and The Lost World do still care about each other, where as in this story we have soldiers who are trying to kill each other from the first world war being forced to survive together in perilous conditions, and not surprisingly some of them betray each other. This can be seen to reflect the time this story was written when compared to the earlier classics. This adventure was written not long after the first world war and not long before the great depression and thus its no surprise that it maybe reflects a more unsure, darker time as opposed to The Lost World. In terms of the Dinosaurs there is a much larger bestiary of creatures, with Tyrannosaurus and Allosaurus making an appearance. Edgar Rice Burroughs was fascinated by Dinosaurs. Arthur Conan Doyle and Jules Verne had an interest in them, but Burroughs loved them so much he would write many books about the beasts and so I think he really relishes in the Dinosaur sequences more. Also Burroughs goes into much greater detail about his Lost World than even Conan Doyle did and he provides a full and proper explanation as to why it exists with evolution being determined by the location of the island and individual mutation. Its a complicated process which Burroughs describes as such. He also gives it a name Caspak though it is known as Caprona by the explorers with Caspak being the name its natives give to it. Burroughs would write two sequels to the novel, The People Time Forgot and Out of Time’s Abyss. All 3 films were adapted in the 1970’s by Amicus productions though People That Time Forgot and Out of Time’s Abyss were adapted into one film. These movies actually stayed fairly close to the novels though there were still some changes particularly in the later two books film versions. Now I realise that this is a series and not one novel, but ultimately I feel that the Pellucidar novels work better as a series. That’s not to say that the individual stories aren’t great in their own right, but still I find that when you read one it isn’t enough. You have to read another and another, so I am listing all the books together in this list. Burrough’s has always been one of my favourite authors because I think he really had a talent for creating whole worlds that would spread out across many books like no other. Most writers would usually only create one big fictional universe like J R R Tolkien and Middle Earth, but Burrough’s has many with Tarzan, John Carter, Pellucidar, Caspak and the Amtor (Venus) series. Though the Tarzan and Pellucidar series were actually linked via a crossover story Tarzan at the Earth’s Core. The Pellucidar series revolves around yet another land at the centre of the earth where Dinosaurs and other prehistoric creatures still roam to this day, but it combines magical, fantastical elements with science fiction concepts. Its much wilder than previous Lost World stories and features ideas like sentient Pterosaurs called Mahars that are able to take control of people via mind control and kill their victims by forcing them to drown themselves, and best of all a flying Stegosaurus that is able to glide through the air using the plates on its back in Tarzan at the Earth’s core. Pellucidar takes the Lost World formula to a whole new level by filling it full of many fictional species of creatures. The closest we saw to this was the ape men in The Lost World, but even then they still had their roots in science and weren’t anywhere near as over the top as the Mahars who have telepathic powers. From this point on most Lost World stories will often invent their own monsters as well as having regular Dinosaurs such as Skull Island with King Kong, the Savage Land in Marvel Comics with its various Dinosaur and ape men and even later versions of Sir Arthur Conan Doyle’s Lost World, such as the version in the 1990’s tv series that has everything from Dinosaur men to Aliens from outer space to Vampires alongside its T-Rex’s and Raptors. The Pellucidar series had a massive influence on many subsequent works of fiction including H.P. Lovecraft’s At the Mountain of Madness. I’d also argue that it had an influence on subsequent adaptations of other Lost World stories too. The friendly native girl that often pops up in the later versions of The Lost World really has more in common with Dian the Beautiful from this series. You definitely need to check all the entries in the series. They are all good adventure stories. Burroughs is one of these writers who is a real page turner. You always want to know what happens next which is why I think its hard to own just one of the Pellucidar books. Surprisingly there have only been two adaptations of stories from the series. One film version of At the Earth’s Core in the mid 70’s starring Peter Cushing and Caroline Munro and another television adaptation of Tarzan at the Earth’s Core which served as the pilot for a Tarzan tv series. This novel was written by paleontologist Bob Bakker. It tells the story of a Utahraptor named Red and her attempts to survive after her pack’s death. Its obviously written from a third person perspective. Really think of it as being like Walking with Dinosaurs though it actually came a few years earlier. The story despite being written by one of the worlds leading experts on Dinosaurs does take a few creative liberties with what the Dinosaurs could actually do. Utahraptor for instance whilst being a formidable predator most likely would not have been able to kill a sauropod like it does in this novel. Its quite an interesting change to focus on a predatory Dinosaur. Normally stories that feature only Dinosaur characters tend to focus on the herbivores like say The Land Before Time. The novel does quite a good job of getting us to sympathise with and root for what was one of the most dangerous predators ever to live on the planet! I don’t know if I’d rate it quite as a classic but it is an enjoyable read nonetheless. Its fun reading about Dinosaurs frolicking in their natural habitat and running around without any damn humans getting in the way. There are many reasons Jurassic Park stands out as the most acclaimed Dinosaur novel after The Lost World itself. Obviously it has benefited in terms of fame from the fantastic film adaptation directed by Steven Spielberg in 1993, but still I think the novel can hold its own even without the film. Its not just another variation of the Lost World theme. That’s the problem with Dinosaurs is that as interesting as they are, there are only a few ways you can bring them back into the modern world. Jules Verne and Sir Arthur Conan Doyle basically established the method to bring them back by having them survive in a little remote area and after that you can tell it was hard for writers to think up new ways that weren’t just variations of that. Even Godzilla though a very different type of Dinosaur story still used that method to bring the titular Dinosaur into modern day. Thus Jurassic Park which had the Dinosaurs brought back by cloning broke the mould and in doing so was able to explore a new theme. The classic Lost World story provided it isn’t just a fun boys own adventure often explores the idea of exploring the unknown. Jurassic Park however is able explore the idea of man tampering with nature. The Dinosaurs are almost like a prehistoric Frankenstein Monster turning on the people who created them. Whilst the ideas in the novel of Dinosaurs being brought back through cloning might seem far fetched it might not be complete science fiction. Jack Horner a leading Paleontologist (who worked on the Jurassic Park films) has in fact embarked on a project to clone a Dinosaur from a Chicken! See here Paleontologist Jack Horner is hard at work trying to turn a Chicken into a Dinosaur. Thus Crichton’s novels may still turn out to be somewhat prophetic! Of course it should be said that Jurassic Park was not actually the first novel to explore the idea of Dinosaurs being brought back by cloning. Carnosaur by Australian author John Bronson revolves around Dinosaurs being created in the modern day through cloning and it predated Jurassic Park by about 6 years. Now I have not had a chance to read Carnosaur yet so I am afraid I could not include it on this list, though it sounds brilliant. Having looked at its synopsis it appears to be more of a comic book type of story about a mad professor who plans to have his Dinosaurs repopulate the earth. Not that I am holding that against it, but still I think this is where Jurassic Park establishes its own identity in that it sees people try and capitalise on the new scientific discovery instead. Still its interesting seeing how nothing is original. Even something as ground breaking as Jurassic Park has a precedent. It would be funny to think that at some point in 1990 this might have happened to Michael Crichton after he sold his novel to his publisher and was talking about this great new idea he had of Dinosaurs being brought back by cloning to his friend at the local store and the person behind the counter who was a fan of Carnosaur gave him a dressing down like this. It could also have happened to Edgar Rice Burroughs when he talked about his new idea about Dinosaurs living at the centre of the earth called At the Earth’s Core and a fan of Journey to the Centre of the Earth told him off. Maybe Skinner shouldn’t have given up on Billy and the Cloneasaurus after all? Another great thing about the way this novel portrays its Dinosaurs is that it actually tries to make them seem like real animals and also brings what at that time were many ideas and theories about Dinosaurs that weren’t widely known to the public’s attention such as the idea that some Dinosaurs may have been warm blooded and that birds evolved from small meat eating Dinosaurs. The Dinosaurs in this novel are fast, quick and as realistic as they can possibly be. There are still a few gaffes however. Most famous of all is that Velociraptor is depicted as a 6 foot tall killer capable of disembowling a human being with its sickle like claw. In reality Velociraptor was the size of a turkey. The reason for this was because at that time Velociraptor was considered a member of the Deinonychus family a much larger group of meat eating Dinosaurs, but this has since been disproven. Still the book did more than simply use Dinosaurs for thrills and escapism. It tried to teach its reader about them and make people see them in a different light. Finally the Velociraptors also helped to make a break from the usual Tyrannosaurus/Allosaurus giant meat eater. The T-Rex obviously still got a look in, but the Raptors gave us Dinosaur enemies who could fight you indoors, sneak up on you, even in some circumstances outwit you. The way they killed you was also more gruesome too. With a T-Rex and an Allosaurus its just one quick bite and that’s that. With the Raptors its a horrific, painful, drawn out affair as they slice your guts open and eat you alive! The novel does have some key differences with the film though I won’t reveal what they are so as not to spoil it for people who might only be familiar with the film. Its a classic piece of entertainment in its own right every bit as much as the film and I can’t recommend it enough. 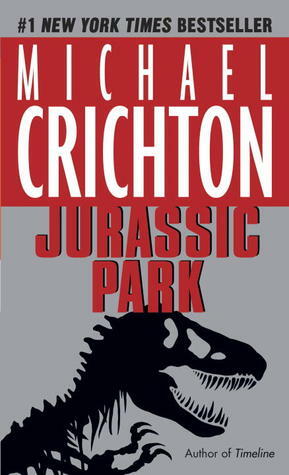 The only sequel that Crichton ever wrote to one of his books. This is not as strong as the original. Really I’d say that there is as big a gulf in terms of quality between the first and second books as there is between the first and second films. However don’t think that means I dislike the book. I happen to still love the second film too by the way. The Lost World doesn’t really add to the point of the first film. Its plot is really just a collection of Dinosaur attacks. That’s not to say it isn’t still a page turner of course. The Dinosaur attacks are very exciting and creative such as the Carnotaurs that have camouflage abilities or the Tyrannosaurus Rex’s smashing the trailer over the edge of a cliff ( a scene that was later used in the film), but again whilst its a good read it doesn’t really feel like it has much else to say from the first book. It bares very little similarity to the film. In fact the only scene from the book that is in the film is the T-Rex vs trailer scene. It could be argued that Spielberg’s film borrows as much from Conan Doyle’s Lost World as it features the idea of a Dinosaur being brought back to civilisation which is from Doyle’s novel. Really Spielberg’s film is like a hybrid of the two Lost Worlds. Thus when you read the book it is a completely new story which is quite nice. I’d say that the book is at places more of a character piece focusing on how Ian and Sarah survive on the island. Definitely worth a look, but not quite the classic the first Jurassic Park is. Of these, I’ve read Jurassic Park and both versions of The Lost World. Some other good ones are Dinotopia by James Gurney and Evolution by Stephen Baxter (which is more about the mammalian ancestors of humans, but does feature dinosaurs in the earlier chapters). Nice list – love the Friends clip! I would love to hear what you think of The Dinosaur Four. It’s an adult time-travel thriller about ten everyday people trapped in the Cretaceous. It reads like a b-movie and the depictions of the dinosaurs are all fairly up-to-date. The Dinosaur Four is available as an ebook, paperback, or audiobook, and I can give you a copy of the audiobook in exchange for an honest review. If you are interested, email me at GeoffJonesWriter [at] Gmail [dot] com. I’d be happy to read it. I don’t have a G-Mail, but my E-Mail is burun100@hotmail.co.uk. Doyle’s novel was based on a REAL PLACE! There really IS a vast plateau in South America. It is called Mount RORAIMA. It borders three countries: Venezuela, Brazil and Guyana. Venezuela has the largest piece. This is a truly amazing place. If anyone has never heard of it, for Heaven’s sake check it out. Stunning, mysterious, dramatic, wild, vast, totally unexplored. EXACTLY the kind of place where dinosaurs would exist to-day. Do a Google image search of it. Watch the web documentaries of it. An utterly fascinating place. Much like Doyle described it: Hostile and inaccessible. It also has the World’s highest waterfall: Angel Falls: 900 METERS! Thanks for that I’ll check it out. 1. Journey to the Center of the Earth. 3. The Land That Time Forgot.